William Ralph Olds (Ralph) was born on the 24th May 1935, in his Grandparents house, in the pretty village of Gulval Church Town, which is situated 1½ miles east of Penzance. Thereafter, he lived with his parents at Polpeor Farm, which is situated approximately a ½ mile from where he lives now, with his wife Tricia. The same house he has lived in ever since 1959. After attending his local schools he was sent to a boarding school in Clifton at the age of 13. Immediately he had to learn a new language, as all of his fellow pupils around him couldn’t understand his strong Cornish accent. After leaving school, he spent a year at home working on the farm, then in August 1953 he enlisted for National Service Duties with the Duke of Cornwall Light Infantry at Bodmin. Later he was sent to York for Basic Training and after returning home was sent straight to Plymouth to join his Battalion. In February 1954, he sailed from Liverpool to Belize (then called British Honduras) in Central America. Ralph Corin Jnr was a founder member of Lodge Lyonesse 6014, but died most tragically in 1947 aged 35 years. Moving on to Ralph’s Masonic career, he was balloted for Initiation and Membership of Mount Sinai Lodge No: 121 on Wednesday 6th September 1958. His Proposer was Brother R.C.Matthews and his Seconder Brother W.G.Matthews both of whom at that time were Stewards of the Lodge. He was initiated on 15 October 1958, at the very young age of 23 years. At that time he remembers thinking that he must be the only member in the Lodge under the age of 40. Although the members of Mt. Sinai Lodge made him feel very welcome, on the way home that evening he had the feeling that he had just joined an “old man’s club”. An exhibition of “computers” was held at Earl’s Court, the first of its kind anywhere in the world. Ralph was Passed to the degree of a FellowCraft Freemason on the 17th December 1958 and Raised to the sublime degree of a Master Mason on 17th June 1959. Following that, Ralph continually dodged and weaved his way round the Lodge room making numerous excuses not to partake in the ceremony, in fact, it was some five years after joining, before he undertook his first piece of Masonic Ritual. That said, Ralph did find Masonic Ritual both fascinating and enlightening and during his year as the 160th Worshipful Master of Mount Sinai Lodge in 1973 (with the Past Masters’ approval) he brought old ritual into the ceremonies, which was not in common use. When he installed his successor as Worshipful Master, he re-introduced the inner working ceremony, which had not been used since 1939. Ralph went on to become the Lodge Secretary for Mt. Sinai Lodge in 1981-1983. In 1998, he was appointed Trustee of Mount Sinai Lodge No: 121, which includes Trustee of the Building, a position he held until 2017. He was made the Lodge Chaplain from 1989-92 and in 2006 became the Lodge’s 193rd Worshipful Master. (Unfortunately, the Senior Warden at that time did not wish to progress to the chair) This was an office Ralph was delighted to fill for the second time in Mount Sinai Lodge. He subsequently served as Lodge Mentor from 2012-17. Meanwhile in 1991, he became a Founder Member of Cornish Ashlar Lodge No: 9446 and later became the Worshipful Master of that Lodge in 1996. He was subsequently made an Honorary Member in 2015. In 1981, Ralph was offered an Active Provincial Appointment, the rank of Assistant Grand Director of Ceremonies. Unfortunately Ralph was unable to take this position owing to his business commitments and running the family farm single handed. He accepted the past rank instead. In 1988 he was promoted to PPSGD and then in 1998 PPJGW. Due to his tremendous contributions to Freemasonry in Cornwall he was once again recognised for his tremendous efforts in 2012, when he received the Provincial Grand Master’s Certificate of Service to Freemasonry at the Provincial Grand Lodge Meeting. Ralph continually attends all Lodge Rehearsals, Committee Meetings and outside events as well as all the regular Lodge Meetings. He is always willing at a moments notice to step into a Lodge Office if asked and is always very happy to pass on his numerous years of Masonic knowledge and advice, when required and requested. Worshipful Brother Ralph is a very proud Cornish Freemason who has enjoyed a long and varied Masonic Pathway. A journey that he still continues to enjoy each and every day and long may this continue. Once again a very special evening enjoyed by all those Brethren lucky enough to attend and certainly another moment in history for Cornish Freemasonry. The Lodge room was packed without a single spare seat available, clearly a very sincere evening for an extra special and popular man. Like many other Lodges in the Province of Cornwall, Mt. Sinai Lodge are extremely lucky to have such an active and loyal member within their ranks. Worshipful Brother Ralph, without any question of doubt you richly deserve your 60 year certificate and evening of celebrations. Like several of those other remarkable men who have recently celebrated 60 years of service to Freemasonry, you are an inspiration for all Freemasons throughout Cornwall and beyond. The Brethren of Mt. 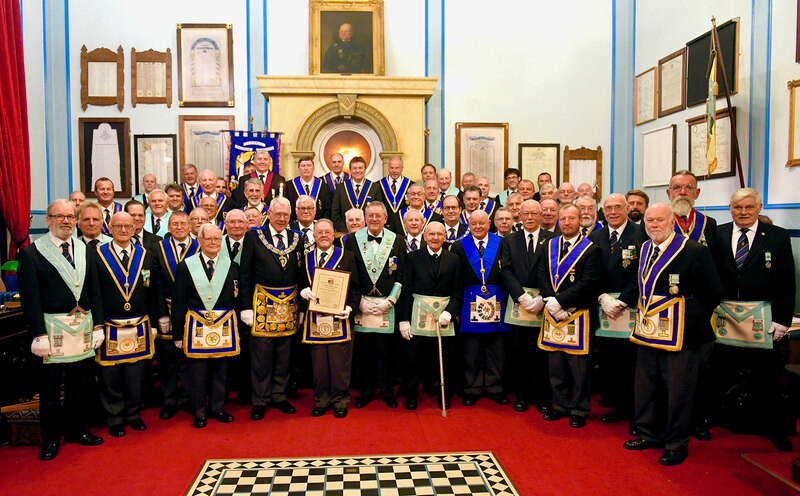 Sinai Lodge together with the members of the Province of Cornwall are honoured to have you amongst their ranks.